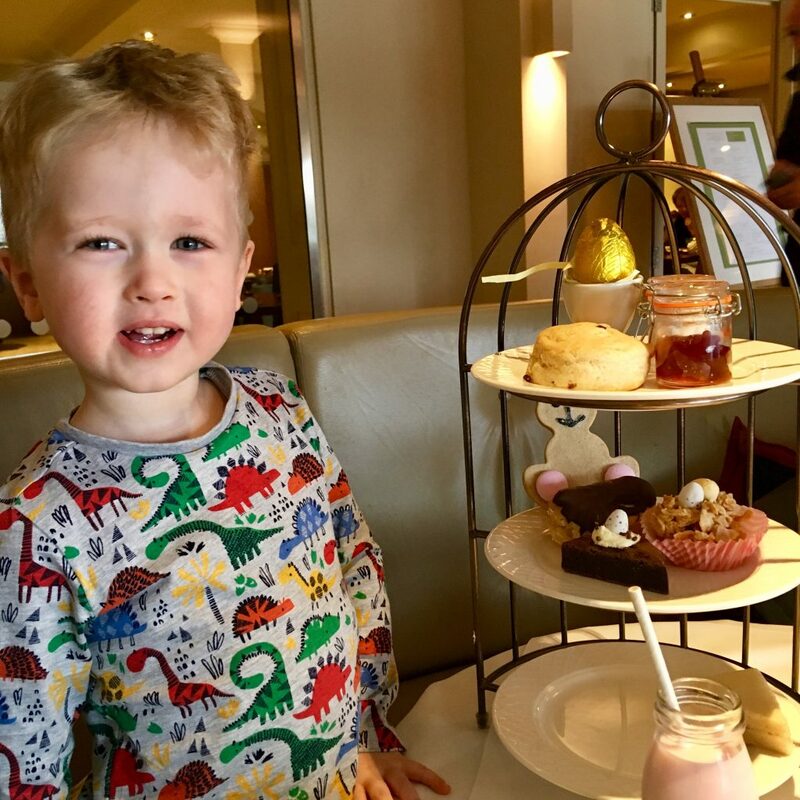 We were invited* along to Cottons Hotel & Spa in Knutsford, Cheshire to sample their much talked about Easter afternoon tea. The journey from ours was easy with it being mainly the motorway and then a main road from exiting. There were plenty of parking spaces when we arrived and from pulling up, we knew it was a well looked after hotel. The restaurant was just to the left when walking through the entrance and after being shown to our table, we were asked what we would like to drink. The table was beautifully laid out, with a little fun pack set by Lucas’ plate containing crayons and colouring activities. Our tummies were beginning to rumble, as we had a light breakfast in anticipation for our Afternoon Tea. We didn’t have to wait long as the chef brought out our fabulous feast and talked us through what was on the stands. Much to Lucas’ delight he had a stand to himself! Lucas’ stand included triangle jam sandwiches and ham sandwiches. 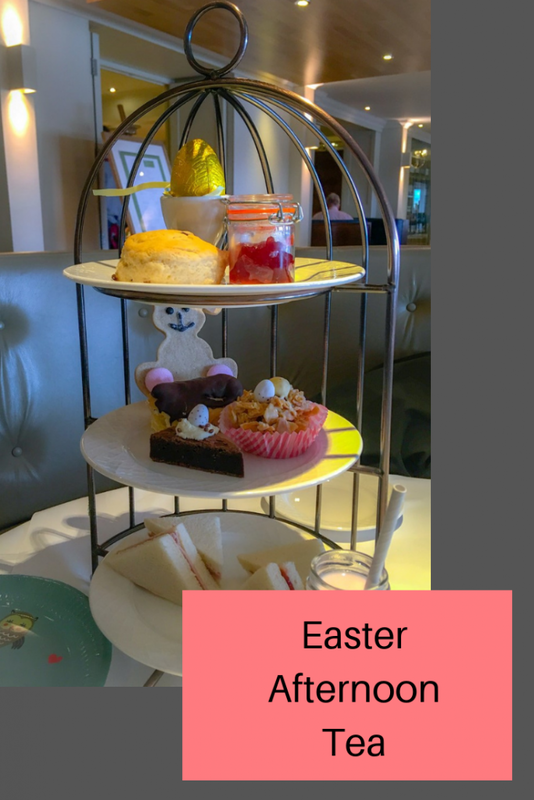 He also had a chocolate brownie topped with popping candy and mini eggs, a gingerbread rabbit, chocolate eclair and a white chocolate cornflake cake topped with mini eggs. As if that wasn’t enough, there was also a scone with clotted cream and jam as well as a chocolate egg, presented in an egg cup! The stand was accompanied perfectly with a strawberry milkshake. On our stand we had finger sandwiches which included smoked salmon with cream cheese, free range egg and cress and tomato and ham. Our sweet treats were warm sultana scones (I love freshly made scones!) 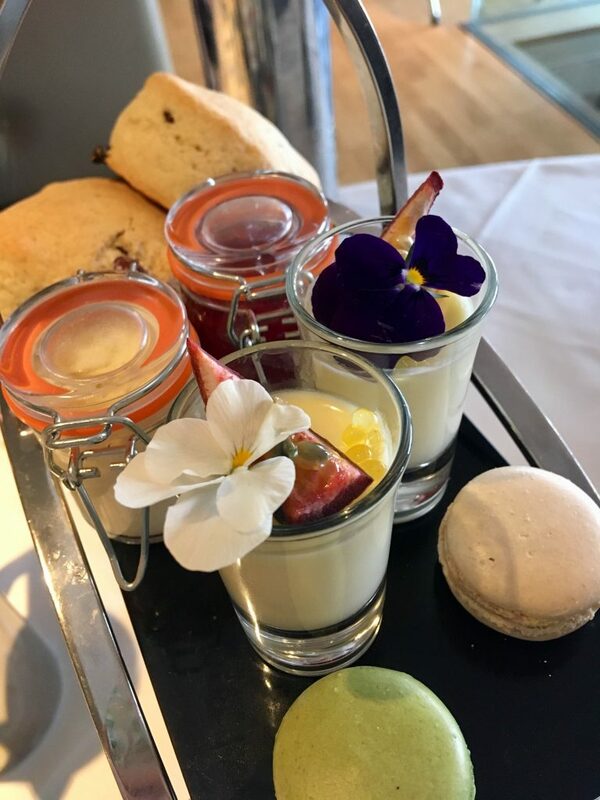 with clotted cream and jam, white chocolate eclairs, cupcakes topped with icing and mini eggs, strawberry tarts, lemon posset’s and macaroons. The food was absolutely delicious and the portions very generous, we were given a box to take anything away that we couldn’t manage there. The restaurant had a mixture of clientele from people using the day spa, hotel residents and people on business meetings. You can tell that it is an upmarket four star hotel, that being said, it had a relaxed atmosphere and the chef and head of guest experience, in particular were very welcoming. After we had finished eating, we decided to take advantage of the spa facilities and use the pool. The spa includes a swimming pool, whirlpool, sauna, steam room, outdoor hot tub and solarium as well as a gym if you fancy a workout. There are also 8 treatment rooms and a relaxation room. I will be returning for a spa day at some point as I could easily have spent a full day there. As we had Lucas with us, we only used the pool and it is huge! It also has a small children’s pool at one end which is a great idea. Oh, wow! What I’d give for a lovely afternoon like this! 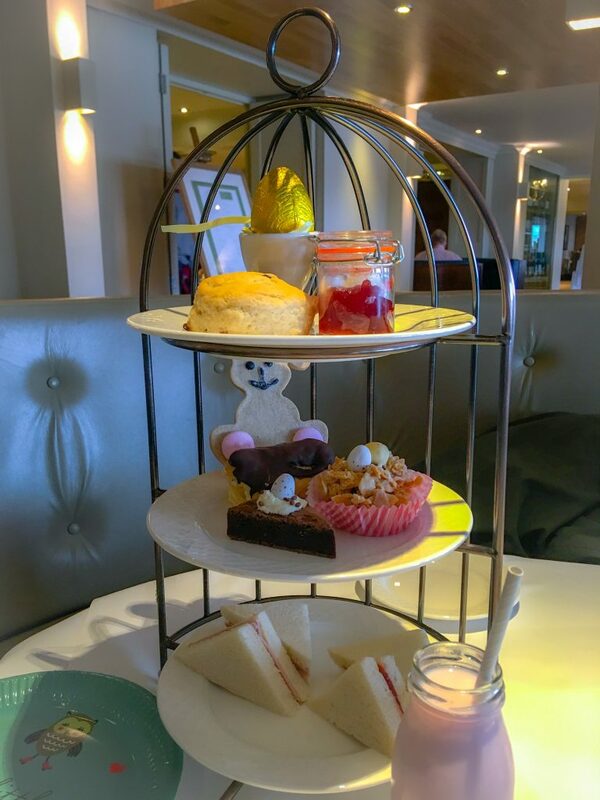 I love afternoon tea and this looks delicious. So cute that they do a separate stand for kids! It has been forever since I went and had afternoon tea anywhere. I really fancy one right here now after seeing this, what a lovely location and delicious bites. 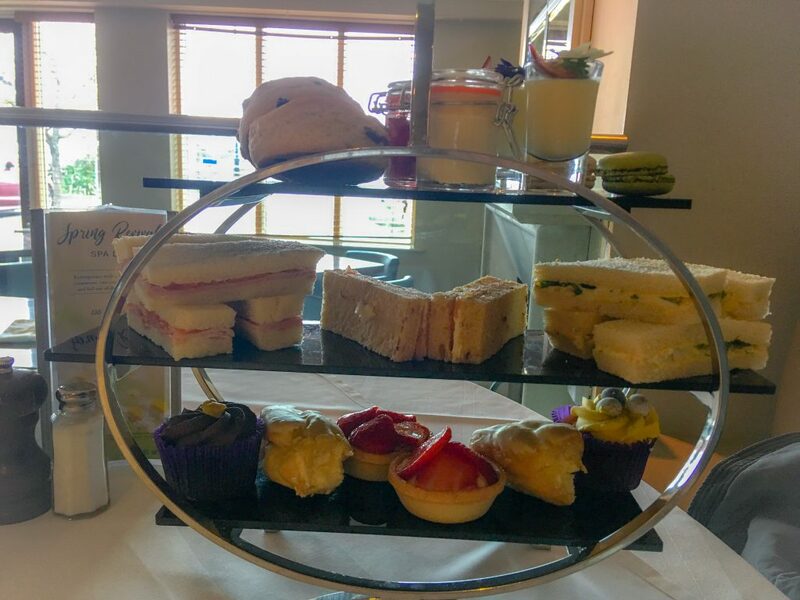 That looks like a super heavy duty afternoon tea – the kind I like! This looks so delicious! I love the Easter theme!